The good news is that Chris found one of their old style maps which had not been scrubbed from their website, and is annotated with the following text. NSIDC has deleted the original graphs, but seem to have forgotten to get rid of the copy. Here is where they get in trouble. Besides deleting data, NSIDC also deleted a lot of older ice when they switched maps. Note inside the circle how the red five year old ice has disappeared in their new maps. The alterations are huge, and shown in the graph below. NSIDC deleted almost half of the five year old ice when they switched to the new maps. They also deleted about a third of the four year old ice, and some of the three year old ice. Referring back to the top graph again, it becomes clear what they are up to. 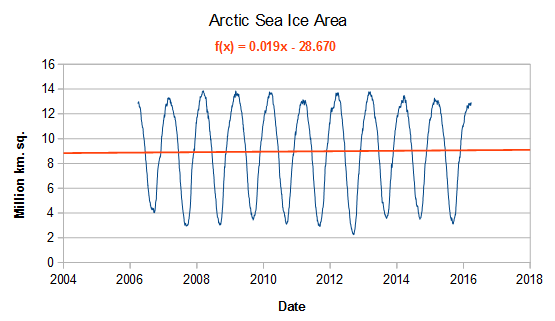 Had they used the same map set for the 2016 data as they did for all the other data in the graph below, 2016 would have had the most 4+ ice since about 2009. The graph below is junk science, useful only for propaganda. It is bad enough that they switched data without telling anyone and used it to generate meaningless propaganda, but they also deleted all of the 1984 to week 36 2015 data from the disk. Fortunately they missed one map, which is the smoking gun. They are busted, big time. 35 Responses to NSIDC Busted! The entire climate scheme is rigged. If we don’t solve this we’re going to pay a very high price. Keep up the goed work and thanks for the info. Plaster it all over the web. When you start comparing the “hidden” chart with what was actually published you can find large areas where 3, 4, 5 year old sea ice has basically been ERASED !!! Surely a so-called scientific institution doing this, is tantamount to SCIENTIFC FRAUD !!! The whole area along the northwest coast of Greenland has been CORRUPTED. !! Still be a snowstorm in Denver? Wow! 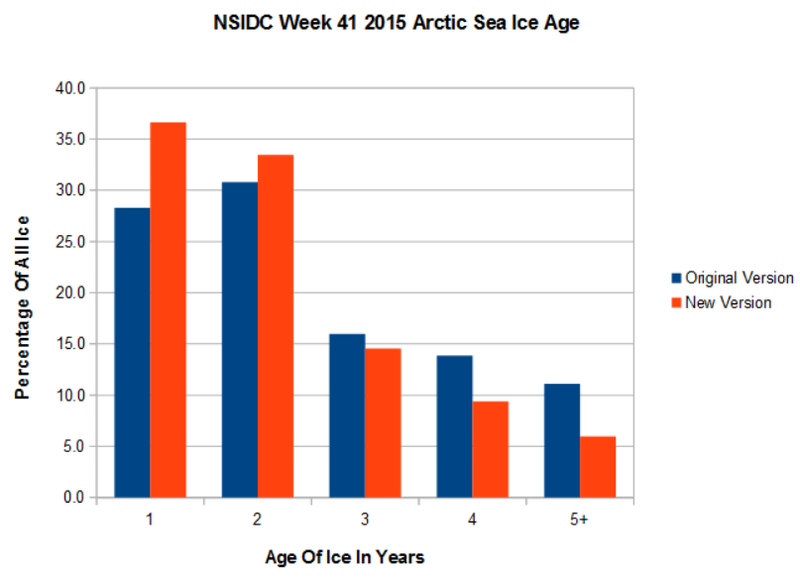 I suspected that something stunk to high heaven after seeing your last post, that showed that most of the 4-5 year ice had mysteriously disappeared. But due to some good detective work by Chris71, another huge hole has been blown into whatever credibility the alarmists have left. The last time I saw two sets of books for one set of activity, there was major fraud occurring. 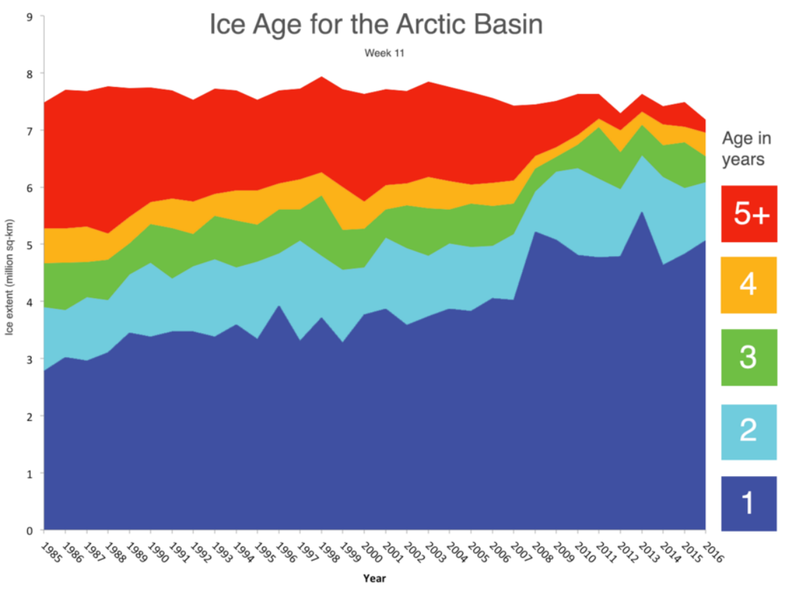 Arctic ice area hasn’t changed for a decade. What REALLY upsets them is when you tell them that for most of the first 3/4 of the current interglacial, there was often ZERO summer sea ice. Biomarker data from Fram Strait and other areas show that Arctic sea ice levels are actually quite high compared to most of the Holocene. You can also bring up the Arctic temperature and thus sea ice area related to the (Atlantic Multi-decadal Oscillation) AMO, again something that the Arctic scaremongers refuse to admit to. The AMO has been hovering around its peak for the last several years, and as SG has shown, Arctic temperatures have also been basically flat. Thing is, the AMO is now starting to drop, there is also an large/deep cooling La Nina forming, and the Sun is basically having a snooze. there is a nice animated gif from last year’s maps in the old format. Would be interesting to add the new format to the end of the gifs and see what it looks like. When people like Neven are prepared to admit that Arctic sea ice is still anomalously high compared to all by a short recent period of the current interglacial, then I will start bothering to listen to them. Arctic sea ice was often basically zero in summer for most of the first 3/4 of the Holocene, and is still trying to recover from the beastly cold of the Little Ice Age. We never get anywhere near zero nowadays. Old Norwegian whaling records show ice levels probably a bit less than now even during the late MWP as the world started to chill to the LIA, during which the sea ice level grew to much larger extents than we will hopefully ever see again. 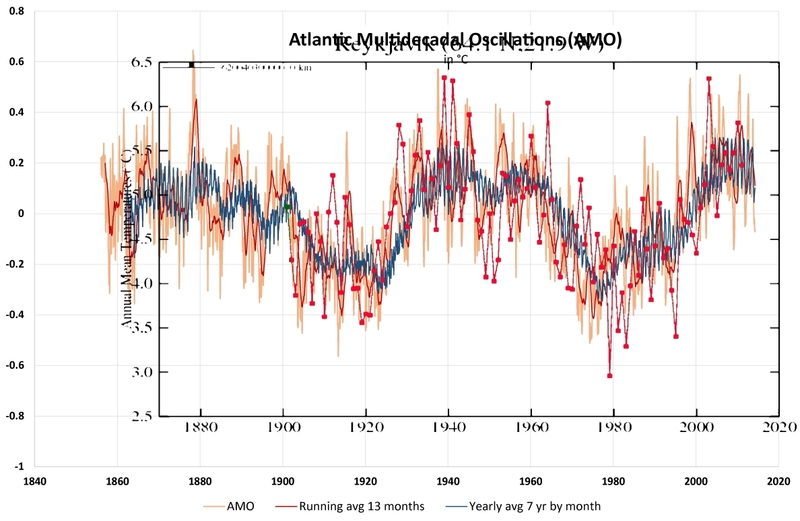 So you tell Neven to accept and make sure that these facts are put forward, otherwise he is nothing but a base level AGW alarmista propagandist. Just wait…..they will come along in about a week or 2, and state that due to “their” due diligence, they found and issue and correct it….forget about acknowledging any blog help!!! It´s ironic that the malpractice within reporting climate variables would never have passed the regulators requirements for monitoring and reporting of even minuscule CO2 emissions. European Union has imposed an extremely expensive bureaucracy on the industry. “Industrial installations and aircraft operators covered by the EU Emission Trading System are required to have an approved monitoring plan, according to which they monitor and report their emissions during the year. Installations and aircraft operators have to monitor and report their annual emissions in accordance with two Commission Regulations, the Monitoring and Reporting Regulation (MRR) and the Accreditation and Verification Regulation (AVR). These common rules are important for ensuring the quality of the annually reported emissions and the credibility of the data. I wish reporting of immensely important climate variables would be subject to the same regulations as reporting of even minuscule CO2emissions. When will we see that the regulators requires that NSIDC is accredited in accordance with ISO 17025 (General requirements for the competence of testing and calibration laboratories), have their monitoring plan approved by regulators and have their reported figures verified by an accredited third party. I would like to see the same from NSIDC. What irks me is that I used their “old” data to come to various conclusions. By changing their data without any explanation they make the conclusions I initially arrived at look stupid. To change data given to the public violates the trust the public has in the “authority” that issues the data. While it is true that knowing how thick the ice is is a very different thing from knowing how “old” the ice is, I find the thickness maps often show up weaknesses in the arguments of Alarmists, especially if you watch where the ice moves. One interesting development is that a lot of ice has been exported from Barents and Kara Seas, which makes that ice thinner (which Alarmists will make a hubbub about) but that ice has been crushed towards the Pole and built a feature of thicker ice that extends right over the Pole and down towards Greenland. Since you’re here Caleb, do you think you could dig my recent comment out of the Sunrise Swansong “moderation queue” for me? Since you are here, Jimbo the putz…. 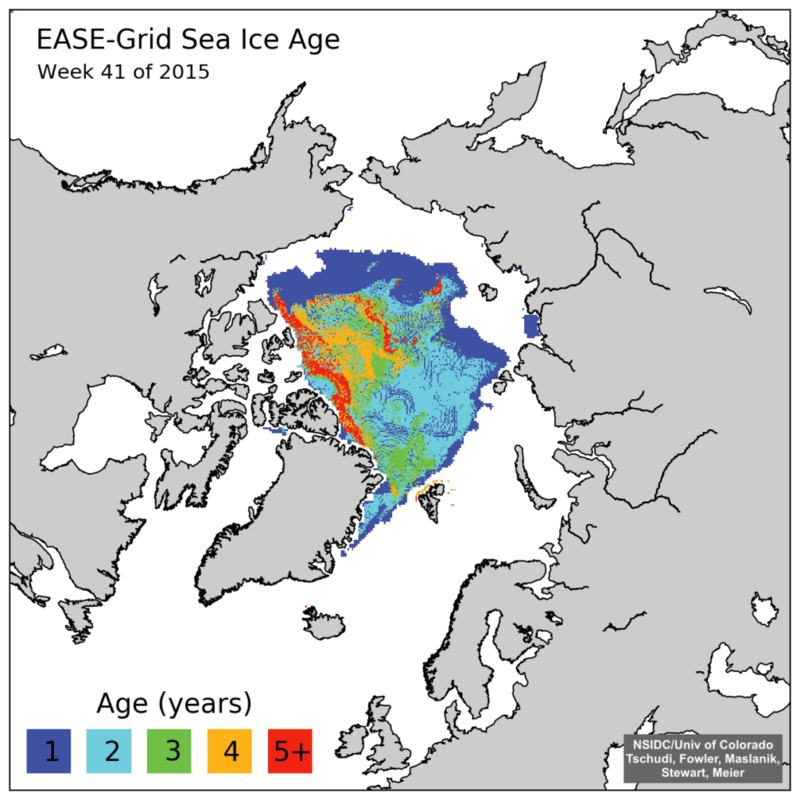 What SHOULD the current level of Arctic sea ice be? In your answer, please refer to the zero summer levels of most of the first 3/4 of the Holocene, and also refer to the LIA which was the coldest period in the last 10,000 year, and we are not that far out of. And seriously, why should anyone bother taking any LYING comment of yours out of moderation. You are only in charge of that base-level misinformation CON site of yours. Then perhaps we could discuss who is lying to whom? We all know who is the LIAR Jimbo. You even had to HIDE your real address behind a link. Truly pathetic, LYING and childish. Answer the question, Jimbo.. or are you too scared to do that? You to a tee. !! Nobody has to publish your inane comments if they choose not to. I made it clear to “Snow White” (AKA Jim Hunt) that until he apologized for certain behavior I would not communicate with him. This occurred two years ago. He has not apologized. I will not communicate. I think we are fortunate to be able to meet on a site like this, and I feel we should have a degree of respect for our host, and also for each other. If we feel we can no longer respect each other, we should make our reasons clear, and then, if the person we are communicating with does not make amends, we should stop communicating. I think our host, at this site, has real guts to stand up to “authorities” that have political clout and a looming, so-called “authority”. Our host exemplifies “speaking Truth to power”. I admire him greatly, but that does not mean I always agree. Dealing with Alarmists is extremely frustrating, and I know all to well there are times we can lose our tempers. Our host has lost his temper, a time or two, over the years. On such occasions I may disagree with him, but I’d never be rude. This site is his house. I am merely a guest. I might want to improve his mood, but I would walk on eggs and be as polite as I could possibly be. I would gently bring up facts he might not be seeing at the moment, and then back off, giving him time to digest. If he he wasn’t in the mood to see my point of view, that would be that. When “Snow White” came barging in two years ago he was very rude to our host. When I tried to gently and kindly inform him of errors he was making he was incredibly rude to me. The time I spent attempting to explain seemed time utterly wasted, like pearls to swine. I also lurk at various Alarmist sites where I keep my opinions to myself, because I know they are unwelcome. It seems the respectful thing to do. I quietly and respectfully heed the opinions of Alarmists, for I am in their house. On those sites Snow White makes it very clear how he feels about our host, and how he feels about others, such as Anthony Watts. It is quite clear he has no wish to be a friend. Therefore, when he appears on this site, I see him as he is: A person who has no wish to be friendly. I pity him, for science is based upon being friendly. The exchange of scientific information is based upon the trust that friends have with each other. It does not include trickery, or slyness, or sleight of hand, or watch-the-pea shell games. Yet that unfriendly stuff, despite all his protests he is reasonable, is the stuff Snow White has shown he is made of. Until he shows a sign he a man made of sterner (and more friendly) stuff, my advise is to refuse to respond to him. You will only be butting your head against the brick wall of unfriendliness. The difference you are seeing is related to the recent reprocessing of Polar Pathfinder Daily 25 km EASE-Grid Sea Ice Motion Vectors to Version 3, which is the input for the EASE-Grid Sea Ice Age Version 3 data set, which is presented in our Arctic Sea Ice News and Analysis site. The reprocessing resulted in some changes in ice age as can be seen in greater age in some bands near Siberia, but less age in the patch noted north of Greenland. The time series trend is quite consistent in both Versions. NS-DIC trying to match Tom and Gavin in the data fraud stakes. Why isn’t this a fraud on the public and the public purse? R.I.C.O. them!!!!!!! Responsible citizens need to make a record of every bit of data on the web sites of universities and government agencies. otherwise they can “reboot” recent history whenever they feel like it. The very fact that a publicly funded institution where all that they produce is owned by the taxpayers, would seek to prevent access to archived versions of data by using robots.txt, is proof that they are up to no good. They are not doing what they were made to do. There is no valid reason for them to prevent access to archived information. So, what’s new? Isn’t this just a variation on “Mann-made” global warming?